Overview - Wojtech Pszoniak stars in Andrzej Wajda's biographical paean to renowned humanitarian Henryk Goldzmit, who wrote under the name Janusz Korczak. The film opens in the late 1930s with pediatrician, writer, teacher, and radio personality Korczak working as the administrator of an orphanage in the slums of Warsaw. When the Nazis invade Poland, move Korczak and his Jewish charges into the ghetto, and begin shipping cattle cars full of adult Jews to Treblinka, the doctor does everything in his power to try to protect the children from the uglier aspects of the ominous quarantine. Friends and well-wishers urge Korczak to leave the children to their fate and save himself, but the dedicated doctor adamantly refuses, demonstrating a dedication to the children that knows no bounds. Pszoniak is superb in this affecting portrait, which is austerely photographed in black and white by the gifted German cinematographer Robby Müller. Remastered in HD for Blu-ray and DVD. Polish with English Subtitles. "We must try, despite all -- we must try, try to live, come what may." Early on in 'Korczak,' it becomes clear to the film's title character that death for the young orphans he cares for is no longer just a distinct possibility, but an unfortunate inevitability. Instead of giving into despair, the doctor does the only things he can; he teaches, he comforts, he guides… he heals. He ensures that life goes on for as long as possible, and prepares the children for a fate not full of darkness and desolation, but dignity and grace. A gentle, somber testament to kindness in the face of absolute horror, Andrzej Wajda's 'Korczak' finds compassion in the midst of hell. Fueled by an understated style punctuated by a hauntingly beautiful finale, the film celebrates one man's unflinching devotion and self-sacrifice. Based on real events, the story follows Dr. Henryk Goldszmit (Wojciech Pszoniak), commonly known by his penname Janusz Korczak, as he cares for Jewish orphans during the Holocaust. Also a Jew himself, Korczak and his orphanage are forced to relocate to the Warsaw Ghetto. As the harsh conditions grow increasingly dire, Korczak attempts to maintain a semblance of normalcy for the children, while he both shields and prepares them for the horrors that loom closer every day. Despite constant offers to escape the Ghetto, the doctor refuses to abandon the kids, choosing to share their fate rather than leave them without a caretaker. The film starts off by showing us a few moments of the calm before the storm, introducing us to Korczak and his orphans before the situation gets out of hand in Poland. While not quite idyllic, these early scenes provide a nice contrast to what soon follows, setting up the doctor and his strong bond with his children. When the Nazis eventually storm the country, Korczak and his kids are herded into the Ghetto, and the narrative gradually reveals the bitter hardships they're forced to endure. Subplots involving the doctor's attempts to keep the children safe, a romance between one orphan and a non-Jewish girl, an angry child's misplaced cruelty, and various competing factions within the Ghetto, all help to flesh out the narrative's larger themes of survival, sacrifice, and compassion. All the while, Wajda's approach mostly avoids sentimentality, traditional story beats or overt dramatization. Instead the film focuses on smaller moments, on quiet instances of humanity between the doctor and the orphans as he tries to care for them under the constant threat of death. Like any film that broaches such subject matter, there are of course several scenes that are truly devastating and hard to watch, but the tragedy is never sensationalized and the story takes on a very intimate quality. Complementing the sensitive, emotional narrative, is the director's naturalistic but still artistic aesthetic. Wajda often employs simple setups with functional cuts that help to engender a somber, realistic atmosphere, letting the powerful content speak for itself. That's not to say the filmmaker's style is invisible, and the director displays an expert command of mood and tone with his painterly compositions and stark, high contrast black and white cinematography (perhaps inspiring Steven Spielberg to take a similar stylistic approach in 'Schindler's List'). While an air of realism is maintained throughout, there are several striking images that evoke a certain visual lyricism. One early scene involving Korczak and the orphans during a rainstorm has an almost magical quality to it, and the film's climax -- which features the doctor walking hand and hand with his children toward a tragic fate -- is expertly staged and shot with a haunting, heartbreaking beauty. The director also utilizes actual archive footage from the Holocaust, organically cutting in brief snippets of documentary material (a camera crew is shown filming the Ghetto within the context of the movie, and the archive footage is usually tied to their POV). Likewise, music is used very sparingly, frequently avoiding any unnecessary manipulation. Instead, score only comes in during very key moments, subtly enhancing the emotions on screen without overpowering them. The heart of the picture rests with its selfless central character, and Wojciech Pszoniak is inspiring as Dr. Korczak. Gentle, wise, and kind he embodies all of humanity's positive aspects. He places the children's needs above all else and fosters little regard for his own safety. Compelled to protect the orphans at all costs, at one point the man becomes so beaten and disillusioned by the increasing doom around him that he all but sleepwalks through the motions, attaining money and necessities for the children with nothing but selfless instinct as his fuel. Throughout it all, the actor crafts a fully believable character, and we can truly feel his passion permeate from the screen. Though he often remains calm and collected, there are a few instances where his bottled up rage explodes, and these scenes are perfectly realized by Pszoniak as he balances hope and suffering in a stirring, memorable performance. As gloomy as the whole affair can get, the doctor never loses sight of what he's fighting for, and whenever he's around the kids he comes alive. Their bond is paramount, and the adorable child actors are all excellent in their roles. Though youthful and innocent, the children are also prone to misplaced anger and cruelty, and the ensemble handles all of the confusing emotions perfectly. 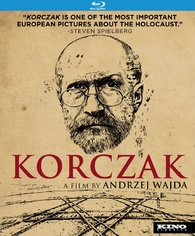 'Korczak' is a heartbreaking, powerful account of one man's compassion and dedication. While the finale's foray into bittersweet fantasy certainly tugs at the heart, the visual metaphor is fitting and the film mostly avoids overt sentimentality. The director employs a deft and sensitive hand, crafting an emotionally affecting experience. Respecting the real life events that inspired the story, the movie serves as a stirring testament to Janusz Korczak and mankind's propensity for altruism, even in the shadow of unspeakable despair. Through the kind doctor's sacrifice, the film reminds us that where there is hate, there is also always love. Kino brings 'Korczak' to Blu-ray on a BD-25 disc packaged in a keepcase. After some logos and warnings the disc transitions to a standard menu. The movie is provided with a 1080p/AVC transfer in the 1.66:1 aspect ratio. Marked by its striking black and white cinematography, 'Korczak' is astounding on Blu-ray, with a surprisingly impressive image full of rich texture, dimension, and fine detail. The source print is in very good shape with only a few fleeting vertical lines and scratches here and there. A few shots of archive footage from the war are peppered throughout, and these quick snippets understandably feature more damage. A moderate to heavy layer of natural grain is present throughout, giving the picture a wonderful, filmic quality (though it can look just a hair blotchy in some scenes). Clarity is often exceptional with sharp detail and a great sense of depth. Fine patterns and textures can be made out in clothing and every strand of hair on Korczak's beard is clearly visible. Contrast is quite hot, however, with very bright whites that lead to a fairly blown out look in several shots. Blacks are deep, inky and consistent. I did detect some slight issues in the film's climax (when the characters reach the trains) with what appeared to be some double imaging artifacts. Thankfully, this anomaly is brief and unobtrusive. With the exception of an odd close-up shot of Korczak early on (which almost looks like it's from a different generation source) and a minor motion anomaly in the finale, the film is absolutely beautiful in high definition. Free of any unnecessary processing, the image retains all of its gritty cinematic texture and offers an impressive, sharp picture. The high contrast style does overpower some scenes with an overexposed appearance, but this seems to be in line with the director's intended aesthetic and works well with the content. The audio is presented in a Polish DTS-HD MA 1.0 mono track with optional English subtitles. Simple but effective, the film sounds exactly like it should. Dialogue is clear and clean with a nice full-bodied quality. Effects work within the single channel of audio is handled well, helping to enhance the mood with background ambiance that never clutters speech. Music is sparse but sounds good during the key moments it comes into play. With that said, dynamic range is pretty flat. Thankfully, I didn't detect any distortion or technical problems. Though limited by its mono nature, the mix carries decent fidelity and is free of any pops, crackles or hiss. Authentic and respectful of the filmmakers' intentions, this is a nice track that offers little to complain about. Stills Gallery (HD) - A gallery of seven stills from the film is included. Trailer (HD, 1 min) - The film's trailer is included. Andrzej Wajda's 'Korczak' is a powerful and intimate look at the horrors of the Holocaust from the perspective of a kindhearted doctor and his flock of orphans. Tragic but inspiring, the film reveals humanity's potential for kindness and selflessness, even when confronted with insurmountable evil. The video transfer is exceptional, maintaining a rich filmic appearance with sharp clarity. The mono mix is of course limited by its single channel of audio, but is clean and crisp. Unfortunately the only supplements we get are a trailer and some underwhelming production photos. Still, the movie and technical presentation are both very strong, cementing my recommendation.